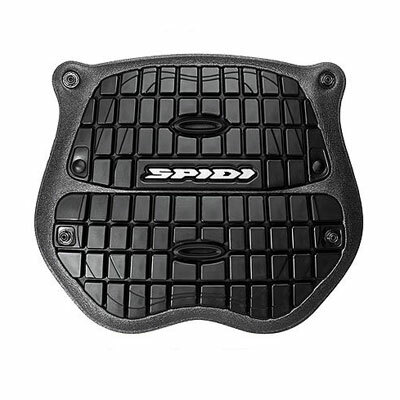 Spidi's effort in the safety field brought the company to certify a chest protector, in fact SPIDI's Warrior Chest is regulated as level 1 prEn 1621-3 (provisional norm for Chest protector for motorbike usage). The Warrior technology is composed by 3 layers shaped as a square blocks structure designed to spread out the shockwave. Warrior Chest Protector main tech specs and features are: - 21,8 Kn shock absorbing value (clears prEn 1621-3 test), - 644 sq/cm area covered by the protector - Biomechanic junctions are able to adapt to the chest's morphology. This also enables easy folding for storage of protector - Max thickness is 15mm (guarantees aerodynamics and comfort) - Great air circulation thanks to wide air vents - 140g weight Warrior chest comes built in or optional on most SPIDI jackets and top range leather suits.